Nusa Lembongan and Nusa Ceningan are two paradise islands in Bali -with no cars and, for Bali, not that many motorbikes, no hawkers, and only one ATM. Life is less expensive, and there is less tourists than in Bali's main island. It's the Bali we've all dreamed of. Actually... it's the kind of place I should keep for myself! 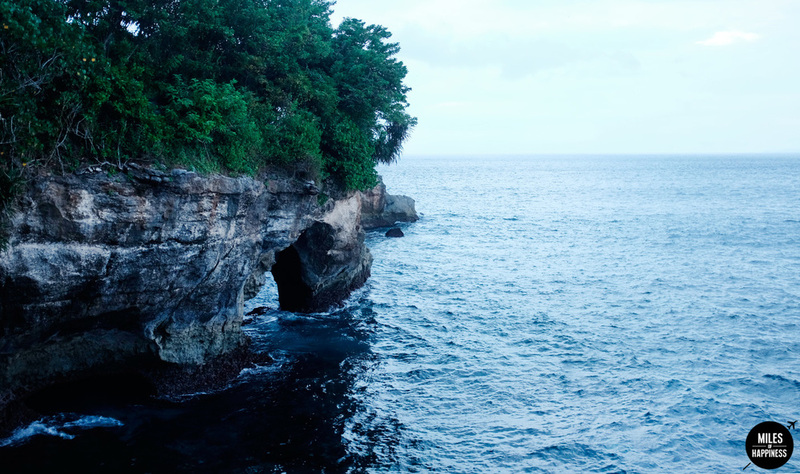 Nusa Lembongan is the kind of place where you find yourself immersed in adventure and the outdoors. Some would say there's not much to do besides lying on the beach, however we found ourselves pretty busy during our stay -between a swim with massive mantas, cliff jumps, sunrise jog on the beach and Bintangs with the locals. Three days were far from enough. But that's okay -we needed an excuse to go back to Nusa Lembongan. There it is. Where are the Nusa Islands? Just south of Bali, about half an hour boat trip from Sanur, lies the Pulau Penida archipelago. It holds three islands: Lembongan, Ceningan in the south, and Penida further southeast. Nusa Lembongan is the closest to Bali, the one where we disembark from the boat, and where most travelers stay. Nusa Ceningan is a very small island about 2km in circumference, connected to Lembongan by a beautiful yellow suspension bridge. And Nusa Penida is a large island that has virtually no tourism, and serves as a wildlife and bird preserve. Arrived there, first thing we do is to rent a motorbike, then hit the road to Nusa Ceningan, where we've spotted some charming bungalows last time we came. The roads are plain fun to drive along, most often along the beach or on the hills, with the most breathtaking views. It's Indonesia, so expect chickens running wild on the road, dogs and even monkeys sometimes, turquoise water everywhere, surf spots, scrubby jungle and natural beauty. It takes us some time to reach our hotel, as we stop every 5 minutes to enjoy the views. The road continues until we come face to face with the awesome suspension bridge connecting to Nusa Ceningan. Last time we came, it was broken -it's now fixed, but it's so old, crossing it with the motorbike makes us feel like real adventurers! As our bike connects, the bridge vibrates ferociously as our wheels bump along each piece of wood. Then we drive along Nusa Ceningan's dirt roads, all the way to our final destination: the Secret Point Hut. Two years ago we've spotted these huts by chance while exploring the islands. They are situated on top of a cliff, watching nice panoramic ocean view with surfing breaks that never stop. The bungalows are enchanting, made of wood, with palm trees all around, outdoor bathrooms... Simple and elegant. We promised ourselves to come back and stay there when we'll have a budget more important. To realize two years later that the ocean view hut with breakfast is only 30US$ a night! The sight is incredibly beautiful in the morning when light falls on flowering trees and on the sand, with birds twittering and calling and the ocean shimmering just beyond the huts. We left at sunrise for an early jog around Ceningan, to discover other paradise beaches. Just for ourselves. Because let's face it, it's 6am and people are sleeping. We fell in love with the place. It was heartbreaking to leave this piece of paradise. The staff was friendly and very helpful regarding the organization of our trip. There is absolutely no sponsorship here. Been there, loved it. Watch out if you book your stay at the Secret Point Hut, you might never wanna go back home anymore. What to do in Nusa Lembongan, Ceningan & Penida? As I said, there's pleeenty to do on the islands. And not only lying on the beach -even though it can be an option. That's the way to do it! Rend a motorbike and get lost on the islands' roads. It's the best way to explore around and discover some hidden treasures. Not a motorbike fan? Rent a bicycle. Wanna see something unusual? Coming from Nusa Ceningan, when you cross the bridge in Nusa Lembongan, take the right. You'll get a beautiful road through lush forest and mangroves. Then at some point, the dump. Look up. Do you see them? Hundreds and hundreds of huge spiders everywhere in the trees. I told you unusual, not beautiful! I know you won't have any troubles to find beautiful views, the islands are stunning. The waves around the islands are amazing, although you've got to be careful, as you're entering treatcherous waters. There are five spots around the islands: Playgrounds, Lacerations, Shipwrecks, Razor and Ceningan. When you know the names, you know it's not for beginners. 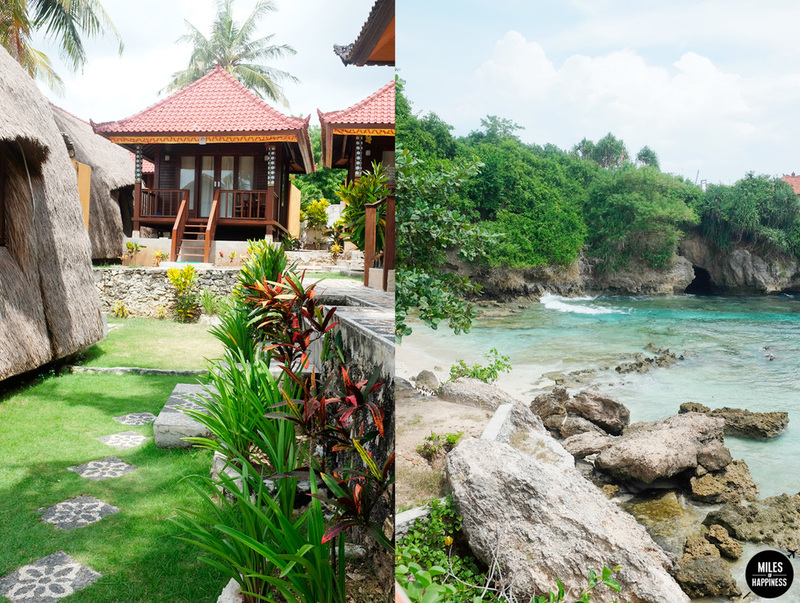 Ceningan surf break is right in the Secret Point Hut's backyard. That's our ritual in Indonesia. We always try to get up before the sun rises, G jump in the water with his board, while I go get lost around to take some morning shoots. Imagine yourself surrounded by cliffs, crashing waves slamming against the ground, crystal waters, exotic jungle and the perfect light. How could you resist? My first snorkeling experience was in Nusa Lembongan, two years ago, and I always thought I beautified this moment in my mind. Well, I didn't. Snorkeling in Nusa Lembongan really is unique. We go with Captain Bobo, his warung/house/boat is situated in Lembongan, on the Mangrove. Only 7 people on the boat, the atmosphere is laid-back and friendly. Arrived in Nusa Penida, we look up for mantas until we find one, then we all quickly jump in the water to see it closer. The water is clear and calm. The manta is so big, it's majestic. It feels like it's flying. We are overawe. But we won't stay too long on the water, as it's full of jellyfish stinging us (no pain, no gain!). Afterwards, the snorkeling adventure continues in Crystal Bay, the Wall and the Mangrove -no jellyfish there, only shallow waters overflowing with colorful fishes and corals. What a wonderful world! We went with Scootcruise, which is supposed to be the best company running to Lembongan. It's fast, efficient and safe. We paid 40US$/pp. They picked us up in our hotel at Seminyak to go to Sanur pier, then took the ferry boat to Nusa Lembongan. We arrived in Jungutbatu Village as the boat pulled up on the beach, then disembarked through shallow water on the beach. There are resorts and developments, but they haven't taken over the place yet, and it's all well made. Only wooden bungalows and small hotels with an authentic feel. Right now it's a mix of holidaying mixed with down-to-earth adventuring. But tourism is growing fast and they are building a lot. So go, take your ticket and explore these paradise islands before it's too late! Newer PostHow to Survive Hong Kong Summer Heat?